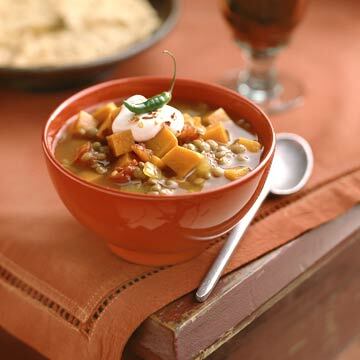 Curry blends with grated fresh ginger and colorful sweet potatoes to give this low-fat lentil soup a different flavor. In a 4-quart Dutch oven, cook onion, jalapeno, garlic, and ginger in hot oil over medium heat until tender. Add lentils, sweet potatoes, tomatoes, broth, water, curry powder, and salt. Bring mixture to boiling; reduce heat. Cover; simmer 25 to 30 minutes or until lentils are tender. Top servings with yogurt or sour cream and garnish with chili peppers and/or crushed red pepper, if you like. Makes 4 to 6 servings. * Use caution when handling the hot chili peppers. Wear disposable gloves, and wash hands thoroughly after handling peppers while preparing.